Oslo passenger and car ferry ticket prices, timetables, ticket reservations and information for ferries sailing from Oslo to Copenhagen, Frederikshaven and Kiel. Compare all available Oslo ferry ticket prices in real time and book the cheapest available Oslo car and passenger ferry tickets sailing to and from Oslo, Copenhagen, Frederikshaven and Kiel with DFDS Seaways, Stena Line or Color Line ferries online with instant confirmation. Book Oslo Ferry Tickets with DFDS Seaways, Stena Line or Color Line for ferries sailing from Oslo to Copenhagen, Frederikshaven and Kiel online in advance to enjoy the cheapest available ferry ticket price. The price you see is the price you pay. There are no hidden extras or surprises such as added fuel surcharges or booking fees and we do not charge you anything extra for paying with a Visa Electron card. The price we quote you for your selected Oslo passenger or car ferry ticket, onboard accommodation and vehicle type is all you will pay, and that's a promise. To obtain a Oslo ferry ticket price and book your ferry ticket securely online please use the real time ferry booking form on the left. You are also able to add a hotel at your destination, or anywhere else, to your ferry ticket when completing your ferry ticket reservation. Oslo, the Viking city, the culture city, the winter capital, the city of rolling green hills and spectacular fjords is the capital city of Norway, aptly credited with many adjectives. Oslo city breathes adventure with rich history pulsing through its veins. Soak in the beauty of the Vigeland Park and feel the wind in your hair as you ski down the jewelled snow clad slopes of Oslo. To make the most of your holidays in Oslo, we have listed the top highlights of Oslo such as the top landmarks, top bar and must do activities in Oslo. This capital city of Norway is not just rich in its diverse cultural existence but is also known for its romantic scenery, which is preserved within its limits. Though, most importantly do not forget to pick up ski boots or snowboarding boots when visiting Oslo’s biggest ski centre. The construction for Arkeshus Fortress was started under the reign of King Haakon V to defend Oslo against invaders. The fortress is medieval in structure and has had a colourful history throughout its existence. This medieval structure has been used as a prison housing some notorious criminals. There is a Royal Mausoleum in the castle where the Norwegian Royalty lies buried. The National Gallery offers a feast for the art lovers as it houses a vast collection of sculptures, paintings and drawings. Not to be missed are the paintings 'Madonna' and 'Scream' by Edward Munich. The older exhibits of the museum prominently feature artworks from Norway. French impressionist paintings and artwork by artists from all over the globe is housed here. The Opera House sits amidst the Old harbour and makes a spectacular architectural landmark for the area. For the first time visitors can literally walk on the roof of the Opera house. You can buy great collections of CD's at the Opera and there are many gourmet opportunities for the food lover. A workforce of over 600 people is employed for the smooth management of the Opera House. The Polar Ship Fram - Come aboard the 'Fram' the polar ship to travel to the farthest north and south corners of the earth. The tales of the explorers as they charted the ship through water and ice, literally, makes for a fascinating journey. Visitors can have a close look of this legendary ship at the museum. A lot of paraphernalia related to polar expeditions is housed here. The star attraction of the museum is 'Ida' the fossil of an early primate. It is the most complete and also the oldest fossils known today. The exhibits for the museum have been collected and preserved for a span of almost 200 years. It is an interesting journey through the geographical and zoological museum. The Botanical gardens are rejuvenating while also being informative and enlightening. The Kon-Tiki museum houses the collection of exhibits from the famous expeditions of the Norwegian explorer Thor Heyerdahl. It has exhibits from the expeditions of Tigris, Kon-Tiki, Fatu-Hiva , Easter Island and Ra. The raft used for his journey from South America through the Pacific Ocean to the Polynesian islands is stored here. A whale shark, the largest fish in the world has found a home in the basement of the museum. The Viking ship museum is a foray into the life and culture of Vikings. The star attractions of the museum namely the Viking ships Gokstad, Tune and Oseberg. Different domestic items, sledges, carts, tools, jewellery and textiles from the Viking age are displayed here. You can buy replicas for the Viking ships, jewellery, wood carvings and even bouts dedicated to Vikings from the museum store. Featuring dozens of scintillating rides, the TusenFryd Amusement Park is wonderful for the enjoyment of the whole family. A part of the park is dedicated only to younger children so even your tiny tots can have a blast at the park. There are many games to be played and many delicacies to be savoured at the amusement park. Beach volleyball, a river, a swimming pool and a triple slide are the added attractions during summer. The Vigeland Sculpture Park is a world renowned attraction of Oslo and a popular landmark. The park is over 80 acres and has sculptures designed by Gustav Vigeland in granite and bronze. There is a section of the park dedicated to children where bronze statues of children engaged in play are portrayed. The whole theme of the park is the human condition and portrays figures in different moods. Smudget is a godsend for music lovers. It hosts over 600 live music concerts in a year. The audience coming to the club ranges from all age groups and amounts for a vivid and charged atmosphere. Fans of jazz, blues, funk, soul, rock and R&B can find their home here! Located right along the Akerselva River, Blaa sports a great atmosphere and is a pleasure to visit at any given time. This is a hot and happening place for followers of house, jazz, hip hop and electronic. Bar Boca is a throw back to the 50's and 60's. It takes you back in time with its vibrant atmosphere accompanied by delightful cocktails and drinks catered by professional bartenders. The Parkteatret is a great place to hang out whether you are in the mood for a drink, coffee or a light snack. It houses a quality selection of cocktails and drinks along with rich coffee and tasteful sandwiches from Hotel Havana. Champagneria has a lot to recommend itself for, ranging from a tangible live atmosphere to quality drinks served in a thrilling ambience. For the wine buffs there is a wide variety available with or without bubble in all price ranges! A trip to Oslo is incomplete without exploring the amazing beauty of the Fjords. The islands near the Fjord have their own distinct character and will enjoy exploring inch of it. Discover the abbey ruins at the Hovedøya, find rabbits at Gressholmen and relax in cosy cabins at the edge of the water in Bleikøya, Lindøya and Nakholmen. Experience the thrill of skiing at the Oslo Winter Park Tryvann (Tryvann Vinterpark). Take the rides of your life while alpine skiing, snow boarding and skiing at this winter park. There are slopes that will suit children, youngsters, adults and even beginners. There are many cycle routes in Oslo that offer splendid views. You can explore the forest trail on a mountain bike or discover trails along the Round Nøklevann Lake route offering scenic views of the rolling hills and the Ulsrudvann Lake. Climb aboard a traditional wooden sail and cruise through the network of green islands, adorned with summer houses in the Oslo Fjord. The Akerselva River is the pulse of the Oslo city. It never remains the same and changes form throughout the different seasons that is fascinating to observe. The river offers a wealth of outdoor opportunities such as swimming, fishing, hiking, walking, bathing and bicycling along the river. Embark on a boat from Oslo City Hall to explore the breathtakingly beautiful islands of the Oslo Fjord and the inner harbour. Here uncover the history of the medieval Akershus fortress that protected Oslo from sea attacks in times of lore. There are many popular routes for sledding in Oslo. Feel the exhilaration and thrill of the embracing snow as you rush down snow clad paths. Some of the popular places for sledding in Oslo are from Akebakken and from Frognerparken. Climb aboard a Double Decker bus with an open-top view of the most interesting locations of the city. You can plan your itinerary at your own pace. You can view some of the best attractions in Oslo this way. Bus stops include the focal sights of Oslo such as the Vigeland Park, Folk Museum or the Fram Polar Ship Museum. Oslo features many happening clubs and bars in the city. It is particularly notorious for its jazz scene. Many clubs just serve food during the day and turn into a nightclub when the sun goes down with pulsing music, pounding beats replete with DJ's and cocktails. Oslo has a rich culture and a deep history that can be journeyed through the various museums dotting the city. The Fram Museum makes us live the adventures of the polar explorers while the Viking Ship Museum brings alive the daring and courage of the Viking warriors. Oslo has good infrastructure for public transport and a dense network of roads, rail routes and T-Bane (underground routes) for the easy communion of buses, railways, taxis and trams. Around 8 different tram lines are spread throughout Oslo. Tickets can be availed from various stations through vending machines. Board a ferry from City Hall to explore the many museums on Bygdoy Island. The museums at the island are located close to each other so they can be easily explored on foot. Other ferries operate from Vippetangen to the other small islands of the Oslo Fjord. Oslo also offers plenty of opportunities for pleasant walks while leisurely admiring the scenic beauty of Oslo. Oslo has a vast and comprehensive bus system. Around 50 different bus routes operate throughout the city. Tickets are available for purchase from the drivers and buses leave from Jerbanetorget which is located opposite the Oslo station. The frequent and varied bus routes makes travelling by bus in Oslo a comfortable experience. When you arrive at the Oslo airport it is best to order a taxi from the booth at the terminal. Coming outside and flagging one usually costs more. Taxis can be hailed in Oslo from the street or from the many taxi ranks available all around the city. It is not necessary to select a taxi that is front in line at the taxi rank. If you wish to pay by credit card, inform your driver about this at the start of your trip. Widely used cards such as American Express, Visa, MasterCard, Diners Card and Eurocard are accepted. The Oslo Central Station forms the nucleus for railways of Norway. Daily trains are available from Oslo to reach the beautiful cities of Stockholm and Gothenburg in Sweden and Copenhagen in Denmark. Trains running in Oslo are managed by the Norwegian State Rail Operator (NSB). You can travel by train to reach Bergen, Stavanger, Trondheim and Kristiansand in Oslo. Local and regional trains can also be taken from the underground station Nationaltheateret which lies below subway station also called Nationaltheateret. Best Price Guarantee - We always offer you our lowest available DFDS Seaways, Stena Line or Color Line passenger and car ferries ticket price to and from Oslo. There are no hidden extras or surprises such as added fuel surcharges or booking fees and we also we do not charge you anything extra for paying with a Visa Electron card. The price we quote for your selected Oslo ferry ticket, onboard accommodation and vehicle type is all you will pay, and that's a promise! In the unlikely event you find the same all inclusive Oslo ferry ticket cheaper in the brochure of any other tour operator we promise that we will do our best to beat that price or offer you the choice of requesting a refund. 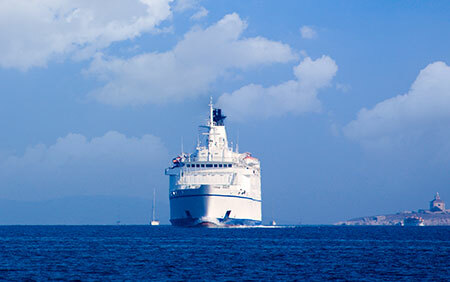 To book Oslo car and passenger ferry tickets please click here. At ferryto.com you are able to obtain live Oslo ferry ticket prices, check availability and book car and passenger ferry tickets to and from Oslo at our lowest available ticket price. Ferryto.com is part of the world's largest online ferry ticket distribution network providing the ability to book over 80 major European ferry operators including to Oslo and to over 1,200 other ferry routes throughout the UK, France, Spain, Ireland, Holland, Eastern Europe, the Mediterranean, the Baltic and North Africa.